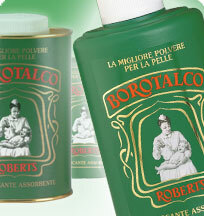 Borotalco Talcum Powder, in Italy, Borotalco synonymous with talcum powder. There is no other, since 1904! For use on the body, and on clean towels and sheets before folding. Fabulous! I discovered this product during my travels in Italy, and immediately fell in love with it. It is very fine and delicate, and its scent is discrete yet distinctive. I highly recommend it to the most discriminating client!